There are some costumes that are nearly impossible to buy used; this year’s blockbuster superhero costumes for instance. You’re going to have to pay retail and the costume will always have that fresh-from-the-factory polyester smell. 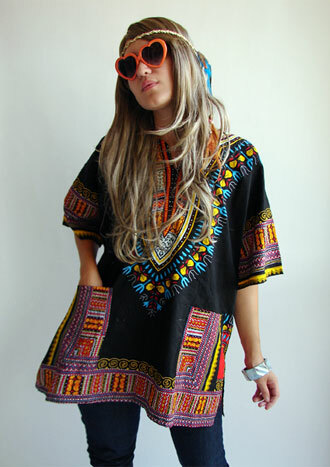 On the other hand, hippie costumes are much easier to buy vintage and at a discounted price. Since the “costumes” are authentic clothing from the 1960’s-70’s the quality is always higher and you’re likely to end up wearing a more comfortable natural fabric instead of the itchy stuff that new costumes are usually made of. 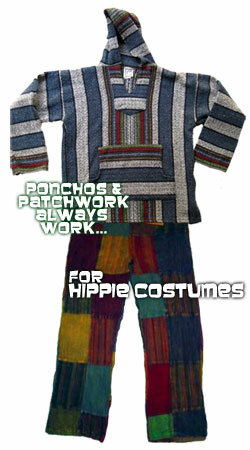 When you take a look at the styles of store bought “hippie costumes” , the choice is pretty much a no brainer. How easy is a vintage hippie costume to put together? After choosing an awesome vintage outfit, it just depends on how detailed you want to get. With the right accessories you can really win some costume contests. For women, you can ride the boho trend with tall boots, ethnic jewelry, and a headband worn across the forehead. A more simple hippie girl look can be achieved in barefeet (weather permitting) or sandals, a pair of comfy bellbottom jeans, some fresh flowers in your hair, and yes even some peace-loving face paint. 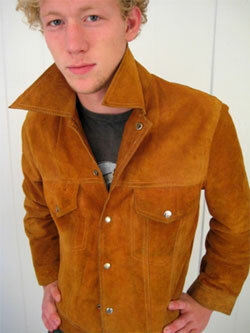 For men, look for anything patchwork, tie-dyed, fringed or “ethnic” looking. Vests, bellbottoms, dashikis and ponchos are good outfit staples. Long hair is a must so if you don’t have your own, look for a long wig . Since hippies were trying to start a revolution, why not use this costume as an excuse to spread your own message of change? Carry around a sign with your favorite slogan about peace. Or use John and Yoko’s: War is Over (if you want it). Remember, hippies did their own thing and defied conventions so get creative with your costume. We can look to the past for inspiration, but there’s no “wrong” way to create this look. If you’re even considering a hippie costume, your friends are all too young to know what a “real hippie” even looked like: you can easily get away with mixing early 60’s with mid 70’s styles. Oh, and one more cool thing about buying a vintage costume? Reusing is always more eco-friendly than buying new, and a great way to make this year a green Halloween. Your local thrift stores are always the best place to start looking for vintage clothing, but eBay has some amazing finds, too. Below are some of the most popular hippie costume auctions to get you inspired or get your costume started. Subscribe to comments with RSS or TrackBack to 'Hippie Costumes with Soul'. This was perfect, now I can be a hippie for Halloween and know how to look!